Writing in the February 23 issue of The Journal of the American Medical Association, a team of researchers led by Dr. Volkow, found that cell phone radiation significantly affected brain function and metabolism of glucose–the brain’s main fuel–in those parts of the brain that received the most cell phone radiation. Did you ever notice the heat of your mobile phone against your ear? While recording muscle tension, we sometimes observe a signal that is NOT the actual muscle contracting. It is an electrical signal that is recorded with sensors at the location of the body but not produced by the muscles. In some cases, this artifact is caused by the client’s mobile phone or other wireless device being activated even though the ringer function was set to off. Below is an example of an artifact signal that can be hundreds of times larger than the biological muscle (electromyography) or brainwave (electroencephalography) signal as shown in Figure 1. Figure 1. 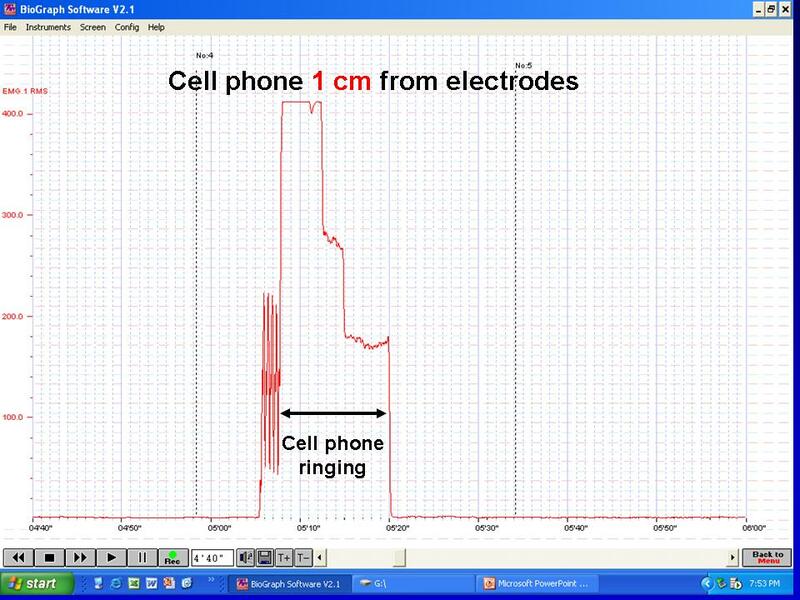 Surface electromyography recording showing the effect of cell phone located 1 cm (0.4 inches) away from the electrodes (from: Lin, I.M. & Peper, E.,2009). By Devra Davis, PhD , President and Founder, Environmental Health Trust, author of Disconnect: the truth about cellphone radiation, Plume, 2011. Children are growing up in a sea of radiofrequency radiation that has never existed in human history. In America today, about twenty million children under the age of fourteen have cellphones. Increasingly, scientists and policy makers in tech savvy nations like Israel and Finland are concerned that the ways these devices are used imperil the brain. The iPhone plastic baby rattle case protects the phone’s glass screen from cracking when chomped on by teething babies, but does not protect the infant’s young brain from the phone’s pulsed digital microwave radiation. The proliferation of wireless gadgets overlooks a critical health issue for pregnant women, men who wish to father healthy children, and those they produce–non-ionizing or microwave radiation damages the brain and sperm of experimental animals. A cellphone is a two-way microwave radio with intermittent and destabilizing pulses, unlike microwave ovens that steadily operate at the same frequencies. The weak and erratic microwave radiation from cellphones and tablets cannot directly break the bonds that hold molecules together, but does disrupt DNA, weakens the brain’s protective barrier, and releases highly reactive and damaging free radicals. A five-year olds brain, healthy or otherwise, is encased in a thinner skull and contains more fluid than an adults. The bone marrow of a child’s head absorbs 10 times more radiation than an adult, while those of infants and toddlers will absorb even more. Few parents appreciate that infant apps of One Fish Two Fish, Peekaboo Farm, and Twinkle Twinkle Little Star may do much more than amuse and distract babies. The American Academy of Pediatrics cautions that children need more real face time than screen time, more laps than apps. The capacity to learn how to tell the difference between mommie and me and learn to think about the other requires holding, touching, smelling, seeing and hearing real live people and cannot be supplanted by intoxicating technological bells and whistles. Every major well-designed study ever conducted has found that those who use cell phones regularly for half an hour a day or more for a decade have a doubled risk of brain cancer, and those who began using cell phones as teenagers have four to five times more disease in less than 10 years. Exposure to radiation from cell phones may also play a role for a growing spate of serious problems, including attention and hearing deficits, autism, behavioral changes, insomnia, ringing of the ears or tinnitus, Parkinsons, Alzheimer’s and a broad array of disturbances to the nervous system. Most disconcerting are findings from the highly respected Prof. Nesrin Seyhan, the NATO-supported founding chairman of the Biophysics Department at Gazi University in Ankara, Turkey, whose studies repeatedly show that prenatally exposed rats and rabbits have fewer brain cells — and those that survive sustain more damage to their brain, liver, reproductive system and eye. Other research carried out by the dozen laboratory collaborative of the European Union Reflex project found that exposures to cellphone radiation directly impaired human brain cells. Despite highly publicized charges of fraud against that work, the Reflex project has been exonerated and others have since independently confirmed their findings. Experimental work completed by teams working with two distinguished experts in male reproductive health, Prof. Ashok Agarwal of the Cleveland Clinic and by Sir Robert John Aitken of Australia’s Newcastle University, have shown that cellphone radiation exposed human sperm die three times faster, swim significantly more poorly, become more deformed and develop significantly more damage to sperm DNA. With one in every five couples having problems reproducing when they chose to do so, the wisdom of the fine print warnings that come with all smartphones to not keep phones in the pocket and avoid contact with the pregnant abdomen or those of teenagers should become standard medical advice. There is no known safe dose standard of cellphone radiation for pregnant women, their developing babies, men who wish to become fathers, or for young children. All safety warnings for cell phones (e.g., keep 2.54 inches from the abdomen ) are modeled on a very large fellow with a big head who talks less than half an hour a day. The average toddler’s head weighs about half as much as the one for whom standards have been set. Cell phones are just one source for microwave radiation exposure. iPads and other wireless tablet systems emit radiation as well, although the former comes with automatic proximity sensors that reduce radiation whenever the device comes close to the body. The safety material that comes with an iPad recommends users hold it eight inches from an adult body—a distance far greater than most toddlers arms. Yet nowadays even babies and toddlers are learning to read from wired devices and falling asleep to white noise played from phones placed under their pillows and connected to wireless routers. What can you do to protect yourself from radiation emitted from high tech gadgets? When it comes to using electronic devices, those hidden safety warnings have it right, so remember: distance is your friend. Don’t hold a cell phone directly up to your head. Use a headset or speakerphone to talk on the phone. Pregnant women should keep cell phones away from their abdomen and men who wish to become fathers should never keep phones on in their pocket. Don’t allow children to play with or use your cell phone. Older children should use a headset when talking on a cell phone. For more information, including a Doctors’ Pamphlet about the need to Practice Safe Phone, written by Charlie Teo, one of the world’s top neurosurgeons, and other experts in the field see http://www.environmentalhealthtrust.org/content/downloads. As seen on Healthy Child. At age 56 my husband was diagnosed with a malignant and lethal brain tumor. Before his diagnosis we had no idea that some researchers had linked prolonged cell phone use with brain tumors. I couldn’t stand idly by—the world needed to know what I had discovered. Ronald B. Herberman, M.D., chair of EHT’s Board and a renowned cancer biologist and physician, indicated that this work offers an important clue about the ways that cell phone radiation can alter the brain and also shows why it is appropriate to take special precautions with cell phones today. According to Lloyd Morgan, Senior Science Advisor to EHT, anything that disrupts the natural metabolism of such critical areas in the brain is worrisome. “The areas of the brain that had increased glucose in the JAMA study are involved in thinking, sensing and decision making, including repression of antisocial behavior,” he explained. Previous work from Prof. Dariusz Leszczynski‘s group at the Finnish Radiation and Nuclear Safety Authority, published in 2008 in BMC Genomics, involved a human study where punch skin biopsies were taken from the forearm of 10 human volunteers who were exposed for 1 hour to cell phone radiation. Study has revealed that the expression level of 8 proteins was changed upon exposure, and 2 proteins were changed in all volunteers, suggesting that protein expression changes might occur in response to RF exposure. Writing in the journal Nature Neuroscience last month, neurobiologists at the California Institute of Technology showed that very weak varying electric fields affect the thinking, resting or sleeping brain. This new work, combined with studies carried out by Henry Lai, Allan Frey and others in the past three decades and documented in my new book, Disconnect: The Truth About Cell Phone Radiation, What the Industry Has Done to Hide It, and How to Protect Your Family (Dutton, 2010), reinforces the need for revamping our current approach to cell phone safety. Cell phone standards assume that no biological impact of microwave radiation from cell phones can occur without a detectable change in temperature. 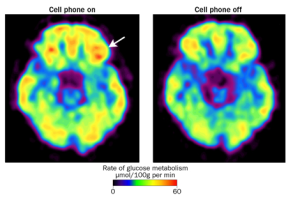 In fact, this JAMA study used phones with a Specific Absorption Rate (SAR) of less than 1 W/kg for 50 minutes and found significant increases in brain glucose–the sugar that provides the brain’s main source of energy. The current study shows, along with other studies, that there are additional concerns related to cell phone use, besides tumors. Tumors are just the tip of the iceberg, but their development is preceded by years of other biological perturbations that have profound medical relevance–and this study confirms that significant biological changes occur after relatively brief exposures such as those that take place daily with the world’s five billion cell phones. Could the stimulating impact of cell phone radiation to boost brain energy explain some of the growing addiction many of us feel for our phones? That is one of the many research questions that should be addressed. EHT is working with experts and governments in a number of U.S. cities and states, and in Finland, France, Israel and other countries around the world, to encourage a major independent research program on cell phones. While that research is being carried out, EHT encourages simple precautions to reduce microwave radiation to the brain and body, such as those recommended by EHT chair Herberman in 2008 and now endorsed by a number of governments and experts around the world. Phones should be used with headsets or speakerphones and not kept directly on the body, and children should take special care not to have direct exposures. EHT is not alone in this. Based on the growing evidence from laboratories and epidemiologic studies, two leaders of the WHO Interphone study on cell phones have recently broken ranks and are now calling for such precautions to be taken broadly. They note the growing biological evidence that microwave radiation from phones has impacts and that epidemiologic studies find increased risks of brain cancer after a decade of heavy use. Professors Elisabeth Cardis and Siegal Sadetzki have urged that it is prudent to reduce exposure by simple means at this time, ranging from using speakerphones and headsets to reducing call time and children’s use of phones generally. A recent widely publicized piece in the journal BioElectromagnetics concluded that because the U.S. and U.K. do not currently have a brain tumor epidemic (from 1998-2007) and cell phones have been in use for a decade, therefore cell phones are safe and there is no need for precaution. To conclude that cell phones are safe misreads the science and misleads the people. Age group using only cell phones showing increase in brain tumors! The two pieces above appeared within a couple of days of one another. The first mentions a rise in brain tumors in the 20-29 year age bracket. The second piece concerns itself with the fact that the majority of those age 25-29 do not have a landline and use only a cell phone. It does not take a medical degree to connect these dots. Perhaps a study needs to be done on the population without landlines. A short MRI developed by Dr. Kesari in San Diego could be given to the participants to see if they are walking around with a brain tumor without knowing it. Or those that have been determined to have brain tumors in that age group certainly should be questioned about their cell phone use. Sounds logical to you and me, right? It is not that simple. The cell phone industry has a lot of money. Scientists and researchers do not. Also, many doctors at fine institutions shy away from this controversial subject as their hospital receives funds from the industry. After my husband’s craniotomy he was part of a study at the hospital where he had the surgery. Considering he has a glioma, the type of brain tumor attributable to long term cell phone use, one would assume that cell phones would have been mentioned in the questionnaire. NOPE. Lots of other questions- lead based paint, asbestos, etc. but not cell phone use. The questionnaire seemed to be one they would have used many years ago. Please read the articles above. Remember, brain tumors generally have a lengthy latency period thus we are only seeing the tip of the iceberg now. It has also been shown that it takes at least 10 years of use of a cell phone to increase your risk of a brain tumor. We are seeing a rise in brain tumors in people in their 20’s which is so frightening as perhaps we are wrong. Perhaps this is more about dose than duration which means if someone uses the phone 2 hours a day for 5 years may be as vulnerable as someone using it 1 hour a day for 10 years. I am not a scientist. I do know too many people who are now suffering or dead from brain tumors from their cell phone use. Please help us at EHT to help stop this madness. Even a small donation will help in our battle to save the brains of our children and grandchildren. Mr Tom Watson (West Bromwich East) (Lab): Good evening Mr Speaker, and good evening Minister. It is a great testament to science and maths writers such as Ben Goldacre and Matt Parker that no self-respecting politician can make speeches in the House of Commons without taking heed of the science behind their contribution, so at the outset let me tell the Minister that I am sure we both agree that public health decisions must be grounded in scientific facts and that our public policy must be evidence based. As we have both read around this subject, we will probably agree that there is no conclusive evidence to prove the link between mobile phone use and brain cancer. Let me contradict myself at the beginning of this speech by making an allegation for which I have little factual evidence. From my experience of nearly a decade in the House, it is my view that the more an industry or organisation wishes to hide something unpleasant or do something unpopular, the more lobbyists it employs to talk to MPs. The $1 trillion telecoms industry hires a lot of lobbyists. I do not seek to persuade the Minister that there is a link between brain cancer and the radiation emitted by mobile phones, but I want to convince her to take a sceptic’s eye to the recommendations before her in future public policy. A number of scientists and epidemiologists believe that although there is no certainty that mobile phone use causes tumours, there are ample causes for concern. At the very least, I ask her to look at the work of Siegal Sadetzki or the earlier work of Allan Frey, and to read “Disconnect”, a recently published book by Devra Davis, and the work of Henry Lai. Some of those scientists and writers challenge the conventional thinking in the telecoms industry. I make no apology for giving their case a hearing in the Chamber tonight, although I accept that they are not the only voices in the debate. I should like to tell the Minister first why the industry needs to put a greater emphasis in its communications to consumers on the potential risks that mobile handsets cause, and secondly, why I am concerned about independent research. I shall also outline what I think needs to be done to remedy those two problems. The Minister is new to her post, but she could make a big difference to public policy before she gets that promotion that I am sure she deserves in the imminent reshuffle that we read about in the papers. The mobile industry is big business and an important player in the UK economy. Ofcom’s most recent figures from its communications market report show that operator-reported retail revenue currently totals £30.4 billion. Mobile retail revenues are £14.9 billion; mobile voice call minutes amount to 118 billion; data volumes over mobile networks increased by 240% in 2009; and more than 96 billion text messages and 600 million picture messages were sent in 2009. The Office for National Statistics estimates that mobile phone ownership has increased from 65% in 2001 to 81% in 2009 and, worldwide, 5 billion people are using mobile phones. In the UK, that means that there are now more mobile phone connections than there are people-an estimated 80 million. “The only basis for precautionary labelling mobile phones would be on a hunch. There is no evidence for it. Of course we should continue research, and make sure it is independent and unbiased, but there is no need to give people the impression that they should alter their use of mobiles when there is absolutely no basis for it”. Yet the mobile phone companies themselves provide precautionary advice-it is just difficult to find it. If someone wanted to make a judgment on whether to purchase a phone based on its specific absorption rate, which indicates how much electromagnetic radiation is absorbed by body tissue while using a mobile phone-the higher the SAR, the more the radiation is absorbed-or on how close to their head they can hold the phone, they could not do so at the point of sale, because the information is simply not there. It is not available on the shop floor or at the click of a button online. I suspect that most sales staff would not be able to recommend which phone a consumer should buy based on its radio frequency exposure either. Yet we know that the legal departments of mobile phone manufacturers are all now slipping into the fine print a warning about holding a phone against the head or body. That, in itself, is not enough, and they are not giving this information enough prominence in their literature. Why are the manufacturers printing these warnings, after years of denying that there was any risk of radiation, if they are of the view that there is no cause for concern? Apple, for example, suggests that users of the iPhone should keep about five eighths of an inch between the handset and the head. Research in Motion-the manufacturer of the BlackBerry-is even more cautious, saying that people should keep a distance of about an inch. For the average user, those warnings require a magnifying glass to read. They are usually in point 8 font size or below and make up part of the little slip tossed aside when a phone is unpacked. If someone managed to struggle through any of these booklets and reached the advice, they would be one of only a handful of people ever to have managed it. How many people even know that radio frequency exposure comes from the phone’s antenna? Not many, I suspect. How many people know that this exposure is stronger when a phone is kept in clothing, which weakens the signal, causing the power to increase? How many people know that it is recommended, if mobiles are carried on belts or in pockets- [Interruption.] I am sorry, would the Whip, the hon. Member for Ludlow (Mr Dunne), like to get in? Is he seeking to intervene? No? How many people know that it is recommended that if mobiles are carried on belts or in pockets, the liquid crystal display and keypad should face towards the body? The fact is they do not. Hardly anyone knows what advice is given on the use of handsets. Although all phones sold in the UK fall within the SAR guidance of 2 W per kilogram in 10 grams of tissue for electromagnetic radiation absorbed, most users would probably be shocked to learn that each handset differs and that the manufacturers give different guidance on using phones. Improved labelling has support among many academics and organisations, such as the EM Radiation Research Trust, which was brought to my attention by my hon. Friend the Member for Sefton Central (Bill Esterson), and Powerwatch. Bill Esterson (Sefton Central) (Lab): Like me, Mr Speaker, you have young children. Also like me, you will be concerned if there is compelling evidence of the dangers of mobile phone handsets or masts. My constituent Eileen O’Connor, of EM Radiation Research Trust, has drawn to both my attention and that of my hon. Friend the strong evidence that exists of the dangers of electromagnetic radiation, particularly to children. Does he support calls for the Government to investigate the safety of mobile phone handsets and masts, and either to issue stronger guidance or to legislate on the basis of that evidence? Mr Watson: Yes, and I am going to make the case that the science should leave no stone unturned. If my hon. Friend lets me develop my argument, I am sure that he might want to comment on it later. Improved labelling has support among many academics and organisations. For example, Alasdair Philips from Powerwatch has stressed to me that safety advice should be included in an obvious position, such as the “Getting started” section of a new phone booklet, not buried in the back pages of the manual. I cannot vouch for those organisations, but they are entitled to have their voices heard in this House. It is often hard for independent organisations to be heard above the cacophony of voices from telecoms lobbyists. San Francisco aims to become the first city in the USA to require large wireless retailers to display a device’s SAR rating prominently. The regulation will come into force at the start of February next year. Lawmakers in Oregon and in Californian cities are considering similar steps. Around the world, other nations are extending the cautionary approach. The German Government, for example, has introduced the Blue Angel phone label. In order for mobile phone manufacturers to be able to display the BA sign on their products, their SAR ratings must not exceed 0.6 W per kilogram. Although the German Government’s current safe limit is in line with the EU level of 2 W per kilogram, it is perhaps the first recognition that the EU’s rating is already much more lenient than that of the US, Canada or New Zealand. In Germany, the Federal Office for Radiation Protection publishes the SAR ratings of all mobile phones on sale in Germany. Why not put the ratings on our direct.gov website, so that British consumers who are interested in the issue can get the facts? The bottom line is that consumers should be given enough information about SAR levels to allow them to make an informed purchasing choice. At the moment, they cannot do that. This Government believe in transparency, and I applaud them for that. I believe in the power of information. The Minister can ensure that consumers are far better informed about the science around their mobile phones, should they be interested. “without potential adverse health effects”. Although Sir William’s report said that there was no evidence of a health risk to either adults or children at the time, it said that children should be discouraged from making “non-essential” calls until further research had been completed. Bill Esterson: My hon. Friend seems to be saying that there is strong evidence that is worthy of further investigation. He mentioned the fact that manufacturers give warnings, but that they are sometimes difficult to find. Does he think the manufacturers issue those warnings to cover themselves legally, just in case there is a problem, or perhaps because they have strong evidence? Does he agree that, either way, it is imperative that the Government take action now? Mr Watson: An optimist would say that they are adopting the precautionary principle in regard to health. A pessimist might say that they are adopting such a principle because of possible legal cases. Either way, they are not doing enough to provide clear packaging. This advice was influenced by the Stewart report. “The fact is that the widespread use of mobile phones is a relatively recent phenomenon and it is possible that adverse health effects could emerge after years of prolonged use. The evidence base necessary to allow us to make firm judgements has not yet been accumulated”. The report’s findings make it clear once again that this is not a settled issue. Further research, such as the 2004 Karolinska Institute study, published worrying findings on a link between mobile phones and ear tumours. The institute’s research suggested that using a mobile phone increased the risk of acoustic neuroma by 3.9 times on the side of the head on which the phone was used. There was no increase on the other side of the head, giving an overall rise in risk of 1.9 times. The report went on to conclude that regular mobile phone use over a decade or more might increase the risk of benign tumours. Like the Stewart report and the NRPB report, the Karolinska Institute’s study makes it clear in its findings that this is not a settled issue. Further research is needed. Well-respected epidemiologists such as Dr Lennart Hardell of Orebro university in Sweden have also found that links between mobile phones and cancer might exist. Bill Esterson: Since my constituents drew this matter to my attention, I have looked into the details, as my hon. Friend has done. I have reached the conclusion that it is important, as a parent, to take precautions and to restrict the use of mobile phones by children in anything other than an emergency. I urge the Government to take that point seriously, even at this stage, as well as taking on board all the other points that my hon. Friend has made about carrying out further investigations. Mr Watson: Even with my own beloved children-my five-year-old and my two-and-a-half-year-old-I sometimes have to persuade them not to grab my mobile phone. The precautionary principle should apply, but it is very hard for parents. This is why public information is very important. As I was saying, Dr Hardell, in his study “Long-term use of cellular phones and brain tumours: increased risk associated with use for 10 years”, has reviewed epidemiological studies that found that phone users had an increased risk of malignant gliomas. In carrying out his review, he found a link-although not a causal link-between phone use and a higher rate of acoustic neuromas. He also found that tumours were more likely to occur on the side of the head that the handset was used. His study indicated that one hour of cell phone use per day significantly increased tumour risk after 10 years or more. He also makes the case that this is far from a settled issue. In May, the hotly anticipated Interphone report for the World Health Organisation suggested that those who engage in heavy phone use could be at risk, but stopped short of establishing any firm links from the data. The Interphone study is the largest study to date into phone use and head and neck tumours. Mr Watson: That is a quaint tradition in the House, Mr. Speaker. I had forgotten that I had to engage in it when I was a Whip. The fact that the research team was divided on its findings did not prevent the UK-based GSM Association, which represents the global mobile phone industry, from deciding that the report supported a consensus that there was “no established health risk”, while deriding what it considered to be errors in the report. Despite what the mobile phone lobby continues to tell us, all those studies have one thing in common. The issue of whether mobile phone use increases the risk of brain cancers remains open. The link between phones and cancer may turn out to be like Creutzfeldt-Jakob disease, in the case of which our original fears did not come to fruition, or it may turn out to be like the link between tobacco and lung cancer. The truth is that we simply do not know. Further independent research over a longer period is needed. At this point I must issue a statistics health warning. Matt Parker has implored me to make it clear that we will never reach the point of saying, “Mobile phones do not cause cancer”; there will merely be more and more studies showing that there is no reason to believe that they do not. Dr Davis’s worry about just how independent some of those studies are is backed up by others, including such noted people as the well-respected Henry Lai, a research professor at the University of Washington. Lai began laboratory radiation studies in 1980, and found that rats exposed to radio frequency radiation had damaged brain DNA. He maintains a database of a further 400 scientific papers, from different academics, on possible biological effects of radiation from wireless communication. Significantly, Lai has found that 67% of studies without industry funding show some biological effect of radiation from wireless communication, compared with only 28% of studies that receive some form of industry funding. “That’s not trivial,” he recently told The New York Times. Like Dr Davis, Lai has been pressing for the commissioning of more non-industry research, not only on brain cancer but on other possible biological and health effects. The voices of Davis and Lai should be heard in the debate in the UK. Davis in particular has highlighted the distortion of research during the last decade by a “show me the bodies” approach to the evidence. I believe that there may well be merit in their arguments. As they say, it may simply be too early to expect mobile phone users to develop brain tumours. Davis also highlights in her latest book, “Disconnect”, how when the Hiroshima bomb survivors were tested after 10 years, researchers found no evidence of brain cancer, yet some 30 years later an abundance of cases were found. While the mobile phone industry may point out that the official statistics show that the incidence of brain cancer has changed relatively little, the absence of any epidemic right now is not an argument for complacency. At present, we are awaiting the outcome of the cohort study on mobile communications and health-COSMOS. It differs from previous attempts to examine links between mobile phone use and diseases such as cancer and neurological disorders in that it will follow users’ behaviour in real time. Most other large-scale studies have focused on asking people already suffering with cancer or other diseases about their previous mobile use. They have also been conducted over a shorter time frame. While the COSMOS study will look at long-term use over 10, 20 and 30 years, I think we need to be reassured that it will be properly independent. At present, COSMOS is being funded by the Mobile Telecommunications and Health Research Programme, a UK body that receives hefty funding from the industry as well as Government. In addressing some of the shortcomings, I have highlighted a lack of independent research. I believe the Government must pressurise mobile phone companies to set up an independent fund for research that has the full confidence of all interested parties. This fund should support academics and allow them to examine the risks without interference. Academics and researchers should not be fearful of having funding withdrawn based on what the outcome of their work might be. Setting up a truly independent fund for research is the least these companies can do given their huge profits. Vodafone already stands accused of £6 billion in tax avoidance, just as the NHS and the rest of the public sector is facing massive budget cuts. The phone giant may have denied the claims, but it has now become a symbolic target for protests against the coalition’s cuts. The UK Uncut campaign, organised through Twitter against Vodafone, continues to attract demonstrations at stores across the country. While no Members would support breaking the law, we can all understand why Vodafone’s consumers feel very angry at its current tax arrangements. The Government should not let themselves be pushed around by telecoms lobbyists. It is time the Government took back the 900 mHz-the low frequency-spectrum that they gave to Vodafone and O2 for nothing in the 1980s. When a similar section of spectrum was sold in Germany it raised £2.9 billion, roughly the equivalent of the cuts made to higher education this year. We can get a lot of independent university research with that kind of money. To conclude, I hope I have shown the Minister the following things. Labelling and packaging is inadequate and guidance is buried too deeply in the small print of packaging booklets. Also, the widely held view among manufacturers that mobiles are safe is not yet beyond doubt, as I hope I have shown with reference to the major studies; virtually every piece of major research is inconclusive or recommends further study. An independent fund would also give academics and researchers the confidence that future funding would not be withdrawn based on the outcome of their findings. The mobile industry should use its huge profits to make a sizeable contribution towards putting this into practice. When I applied for this debate, I thought that the House’s main business might finish early today. Notwithstanding the eagerness of the Whip to get home, that perhaps allows me to add one additional point as this debate is entitled on the Order Paper, “Effect of mobile phones on human health”. This week, I talked to a man who nearly broke down in tears when he explained to me that his privacy had been violated by a rogue private investigator listening to his mobile phone messages for a News International newspaper. Phone hacking had affected his mental health. Illegal hacking has caused great distress to those in the privileged position to know whether they were one of the potential 3,000 targets of the News of the World-for that is what one of the investigating officers in the Mulcaire/Goodman case admitted last week. Like me, the victims express amazement that nearly every tabloid newspaper in the United Kingdom failed to report that A-list Hollywood actor, Sienna Miller, was the victim of a phone hack. The distress caused to her by mobile phones speaks for itself. The victims were amazed not to read in every national newspaper that Take That front man Robbie Williams no longer uses a mobile phone because he was sick of being hacked. They are asking questions and they will find peace of mind only when they know that their mobile phone is secure and that everything has been done to investigate their case. With more News of the World executives implicated in the scandal only last week, with the admission that News International is paying the legal fees of the Prime Minister’s director of communications and with the Information Commissioner saying only last week that he will investigate the loss of potentially significant personal data, is it not time that the Government asked another police force-one other than the Met-to take up the case? The former Metropolitan police investigating officer now works for News International. Justice must not only be done, it must be seen to be done. It is now absolutely clear for all to see that leads have not been followed up and that whistleblowers have been intimidated into retracting their public statements. The only way that these mobile phone victims will get peace of mind is for another police force to take over the inquiry and undertake a thorough review of the old and brand new evidence. The Parliamentary Under-Secretary of State for Health (Anne Milton): I congratulate the hon. Member for West Bromwich East (Mr Watson) on securing this debate. I know that he takes a particular interest in this and all other matters of technology, both nationally and in his constituency. He is absolutely right to say that we must heed scientific fact, but his insight into reshuffles is perhaps lacking in a certain degree of fact-or perhaps he knows something that I do not, from sources unknown. However, I wish to thank him for his flattering comments. At the last count there were a staggering 80 million mobile phones in the UK, and the number is still rising steadily. More than 12 million people own a smartphone in order to access the internet and other web-based technologies. The benefits of mobile phones are clear in terms of social networking and rapid communication, and they help people to feel safer and in touch. They are also a way of including people. I feel more comfortable knowing that my children have mobile phones and that I can contact them, as they can me, wherever they are. I am sure that my parliamentary office would say the same about contacting me, particularly during the recess. The hon. Gentleman is right to say that mobile technology has also raised significant health worries. Many people are extremely concerned about the effect of electromagnetic radiation from phones, and we should understand and acknowledge those worries. We should answer them on the basis of the evidence and we should ensure that appropriate protections are in place, so that not only is everyone safe, but everyone feels safe-and the hon. Gentleman has demonstrated that that is not necessarily the case. Can the Minister tell us how that review is going, and if a similar one is being carried out on handsets? Anne Milton: I thank the hon. Gentleman for his intervention, but may I suggest that he may be jumping the gun a little? I have only been speaking for about two minutes, and I will come to all those issues if he gives me a bit more time. The independent expert group on mobile phones and health was set up in 1999, partly as a response to public concern. It was tasked with reviewing the health effects of mobile phone technology. As a newly elected councillor, I was acutely aware of the considerable concerns among people in my ward at that time. As has been mentioned, the group was chaired by Sir William Stewart, the former chief scientific adviser to the Government. Its report was published in May 2000. The report was referring to the National Radiological Protection Board national guidelines, which were in place at the time. It is none the less important to note that Stewart recommended that as a precautionary measure the guidelines should be replaced by more restrictive international guidelines. In recognition of the incomplete scientific knowledge and significant public concern, Stewart made other precautionary recommendations. For example, he recommended that the widespread use of mobile phones by children for non-essential calls should be discouraged. As the hon. Gentleman said, however, warnings are difficult to find, and the small print is very small. I suspect that many people these days are unaware of that guidance. I shall return to the question of scientific evidence in a minute. The Government accepted the advice of the Stewart report and followed a precautionary approach, and most of the recommendations were implemented in full. On Stewart’s recommendation, we moved to stricter international guidelines for exposure. Along with other member states, the UK supports the European Council recommendation to limit exposures to electromagnetic fields, which incorporates international guidelines. By 2001, industry, Government Departments and their advisers were working to the new exposure guidelines for mobile phone technology, so now all mobile phones and base stations comply with the guidelines. An important development following the Stewart report was the setting up of a new research programme in this country-the mobile telecommunications and health research programme, or MTHR. Research has been carried out at centres throughout the country under the management of an independent programme management committee. It is important to mention that it is independent. In 2007 MTHR published a report from 23 completed projects. Since then, further work has been published from the programme. MTHR is a very high-quality research programme and none of the research so far has shown that radio frequency emissions from mobile phones affected people’s health-at least in the short term, although that is obviously not the end of the story. The lack of long-term data, however, has been noticed by MTHR, the World Health Organisation and other regional and international advisory committees. It is also being addressed by an international cohort study on mobile phone use and health known as COSMOS, to which the hon. Member for West Bromwich East referred. The UK forms a key part of the study, and our participation is funded under the MTHR programme. I understand that the COSMOS study aims to follow the health of approximately 250,000 European mobile phone users for up to 30 years. It is a very thorough process. COSMOS will consider any changes in the frequency of specific symptoms, such as headaches and sleep disorders, over time as well as the important risks of cancers, benign tumours and neurological and cerebrovascular diseases. The Department also supports the World Health Organisation’s international electromagnetic fields project, which encourages research focused on specific gaps in our knowledge. There is no doubt that there are considerable gaps in our knowledge at this stage. Apart from the accident risk from using mobile phones when driving, present knowledge indicates no proven risk to health from mobiles, except of course in the easy access that one has to home delivery pizzas and the possible impact on our daily calorific intake, which cannot be ignored. Let me address for a moment mobile phone base stations, which are often called masts. When I first entered politics as a local councillor, that was one of the subjects that caused most concern. Masts provide the communication links by radio waves to handsets, allowing connection to the rest of the telephone system and the wider world. Mobile phones need this infrastructure to function, and it is this infrastructure that has caused so much concern in the past. On masts in particular, Stewart concluded that on the balance of evidence there is no general risk to the health of people living near masts, on the basis that exposures are expected to be very small. However, it is of note that in that connection, too, he recommended a precautionary approach. It was interesting to learn from the Stewart report that the levels of radio frequency exposure from masts, which people thought were likely to be high, were much lower than those from mobile phone handsets held near the head. Indeed, yearly independent audits have shown that mast exposures are well below the international guidelines-in many cases tens of thousands or more times below. The MTHR also reaffirmed that exposures from base stations were very much lower than international guidelines. An MTHR study specifically looked to see whether short-term exposure to radio frequencies from masts could affect people’s health. Although some people attribute their ill-health symptoms to mobile phone base stations-the hon. Gentleman raised this issue-the MTHR peer-reviewed study found no convincing evidence so far that their symptoms were caused by exposure to signals from mobile phones or masts. But, of course, we should not and shall not be complacent: we must continue to keep the science under review. The Health Protection Agency keeps us informed of the science in this area, and its independent advisory group on non-ionising radiation is currently reviewing worldwide scientific studies on radio frequency emissions as part of its regular review cycle, and will report in one to two years’ time. Mr Watson: I am grateful to the Minister for her very gracious answer to my rather long presentation. Does she think there are merits in opening up discussion with the industry on how they can improve their packaging advice and how we can improve public education, particularly for young mobile phone users? Anne Milton: Yes, the hon. Gentleman’s point is well made. As I have said, most people are unaware of the guidance available, and the small print is often extremely small. I am aware of the ability of large and powerful vested interests to lobby, often very successfully. There are, without doubt, eye-wateringly large amounts of money at stake in the mobile communications industry. I assure the hon. Gentleman that I am old enough and cynical enough to apply at all times an appropriate level of scrutiny and cynicism to all information that comes my way-always seeking to find out whence it came and who paid for it. He is right to say that no stone must be left unturned, but the problem is to establish causality. That is why, with ongoing and international studies, following a cohort is essential. We must base any Government action on robust scientific evidence. He is also right to say that it matters who funds research, and I assure him that I will not be pushed around, and I will keep my level of cynicism. However, I cannot comment on phone hacking; he must address those comments to another Minister on another occasion. Within my own portfolio, I will keep my eye on what is going on. As I say, I look forward to the report of the HPA’s independent advisory committee in one or two years’ time. Let me conclude by saying that the Government take extremely seriously public concern over possible health risks from mobile phone technology, as they do all threats. There is a particular issue in that we are aware that health effects might not become apparent for 10, 20 or even 30 years. It is important to remain vigilant and to keep this matter at the top of our list of priorities. We will continue to respond to people’s concerns and to support those high-quality scientific studies, both nationally and internationally, in an honest, open and transparent way, being clear at all times where the vested interests lie. I thank the hon. Gentleman for raising this issue, which is of concern to so many people. Opinions expressed here are solely those of the author, not EHT or its associates.